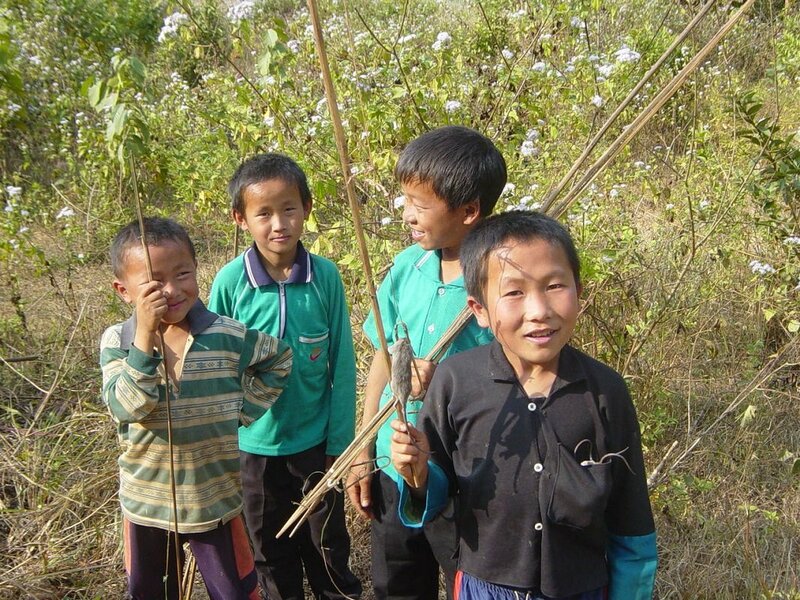 Highlights of Laos Tour - Book 14-day holiday to the quiet country here! 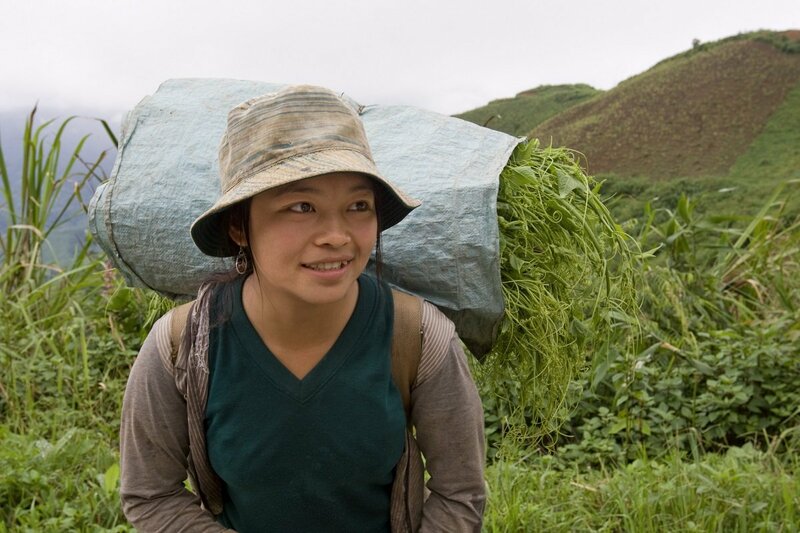 This 13-day tour to Laos is a journey through a fascinating nation, where you can experience a country almost untouched by tourists. In fact, it is almost like travelling through the Far East of yesteryear. You will be travelling with a local, English-speaking guide who will show you a country that is more than happy to welcome tourists inside today. 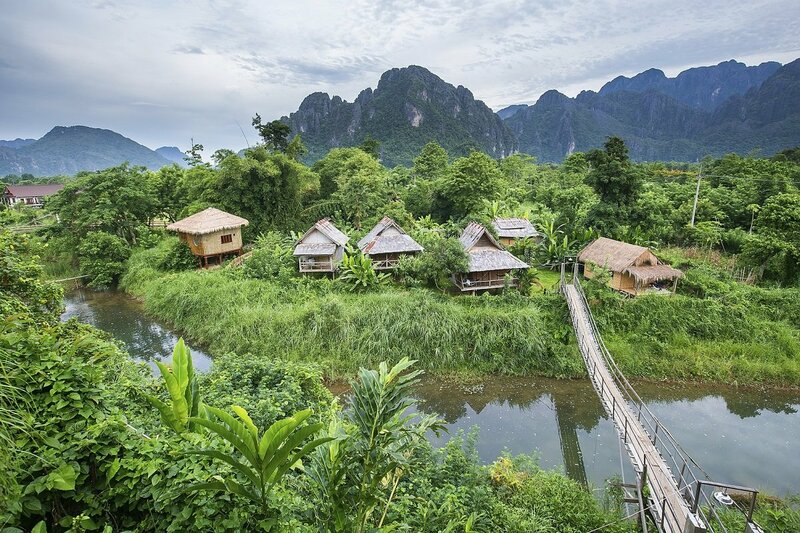 Laos is home to a wide range of cultural and natural attractions – from Luang Prabang to the Plain of Jars and Vientiane – that are without compare anywhere else in the world. 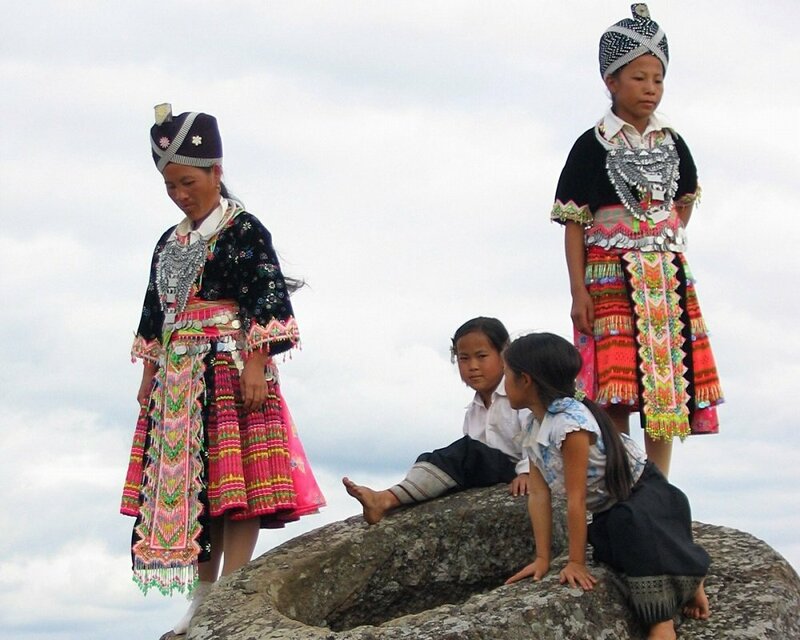 The biggest attractions of all, however, are probably the people of Laos and the quiet dignity they radiate. You will have the chance to experience a country where time almost stands still, and where the tranquillity is palpable. 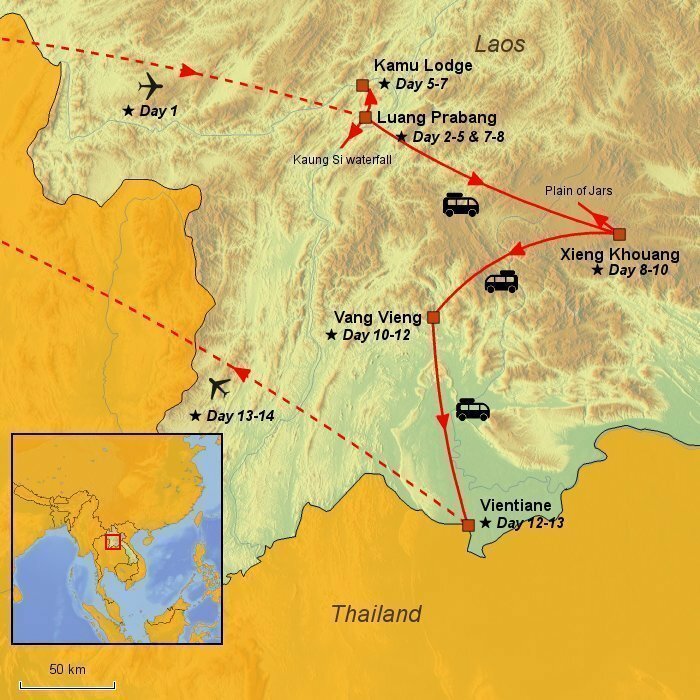 Departure day, where you will fly to Luang Prabang with connecting flights along the way. On arrival in Luang Prabang, you will be issued with your visa at the airport and can then collect your luggage. You will be met in the arrivals hall by a guide holding an Asiatours sign, who will accompany you to the hotel where you will be spending the next two nights. 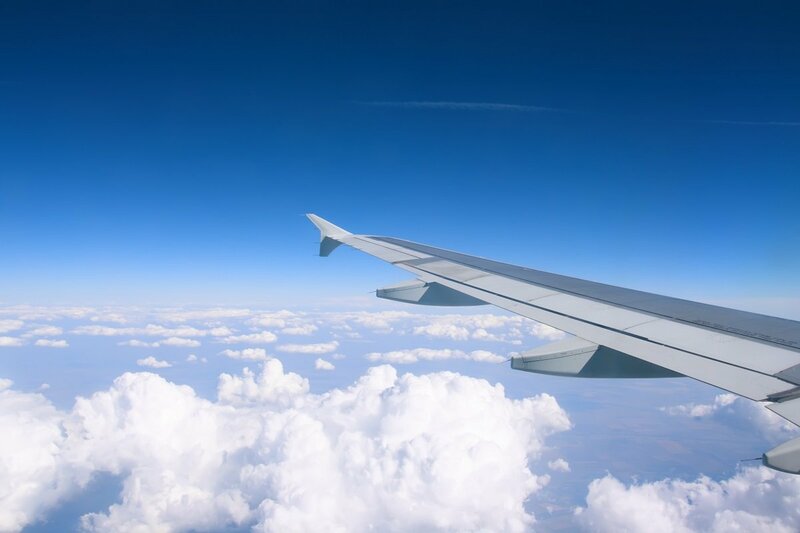 After check-in, you will have some time to relax and rest after your long flight. Towards the end of the afternoon, your guide will accompany you on a stroll through the atmospheric night market in Luang Prabang. 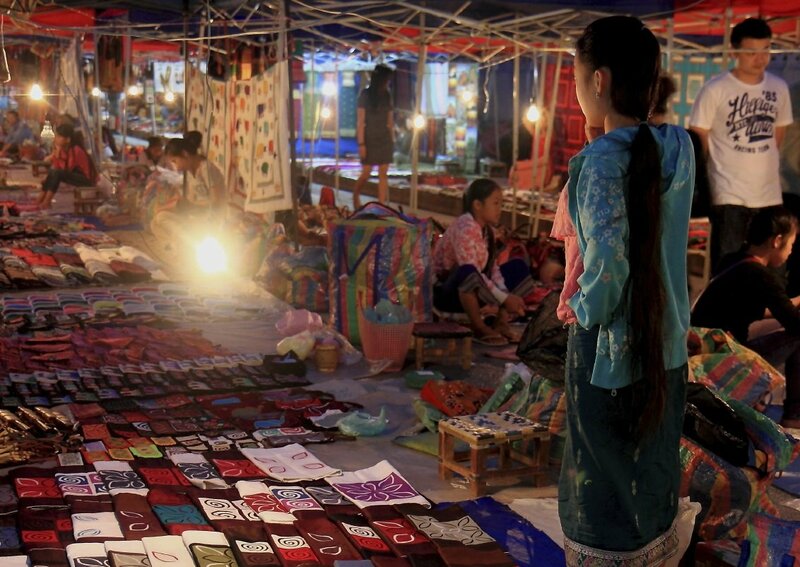 The market presents probably the broadest selection of traditional and ethnic arts and crafts on sale anywhere in Laos. The stalls are overflowing with colourful fabrics, sumptuous rugs, magnificent wood carvings, baskets, ceramic items, clothes, hand-made paper and even Beer Lao t-shirts. This market is open daily from dawn until around 22.00. Frangipani trees with their distinctive mother-of-pearl flowers. 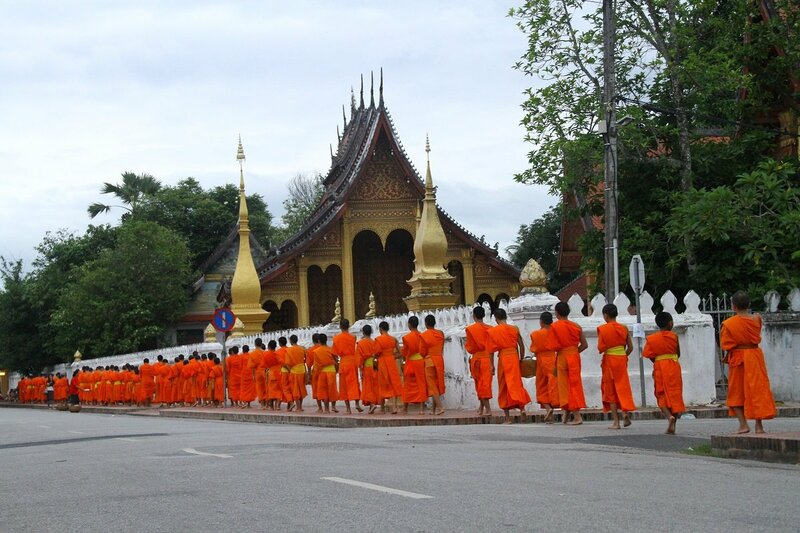 Monks wearing traditional terracotta-orange robes are another common sight. 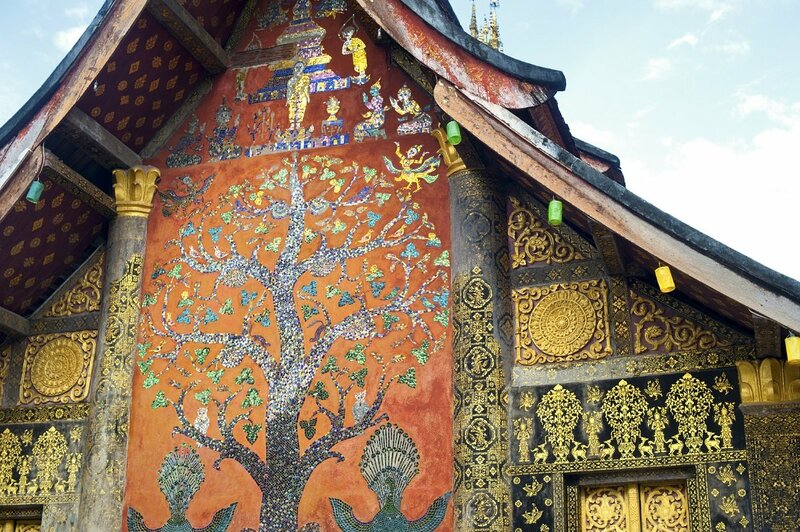 At the iconic temple of Wat Xieng Thong, you can experience a building famous for its beautiful, traditional architecture as well as its intricately carved entrance section, which is clad in gold leaf. No visit to Luang Prabang is complete until you have stood on top of the famous Phousi hill – which you reach by climbing up 328 steps. From the top, you can admire a truly magnificent view out over the city and the river. 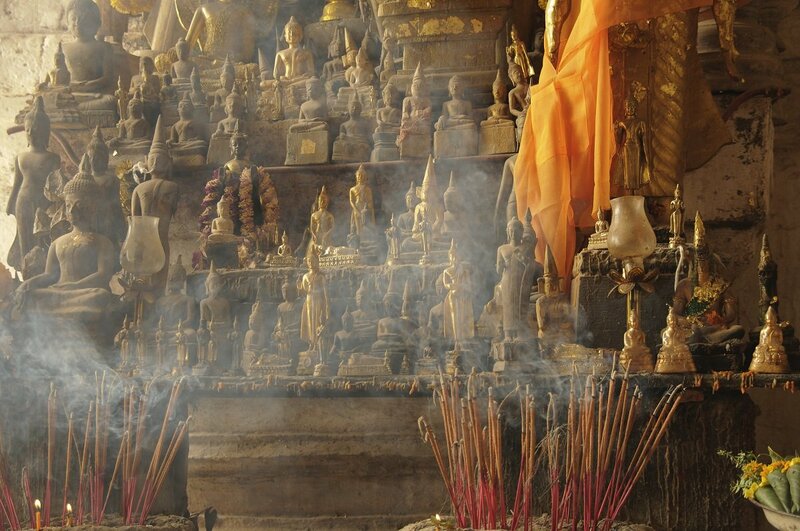 A very special spectacle takes place in Luang Prabang early in the morning, when more than 300 monks file through the quiet streets, collecting alms. 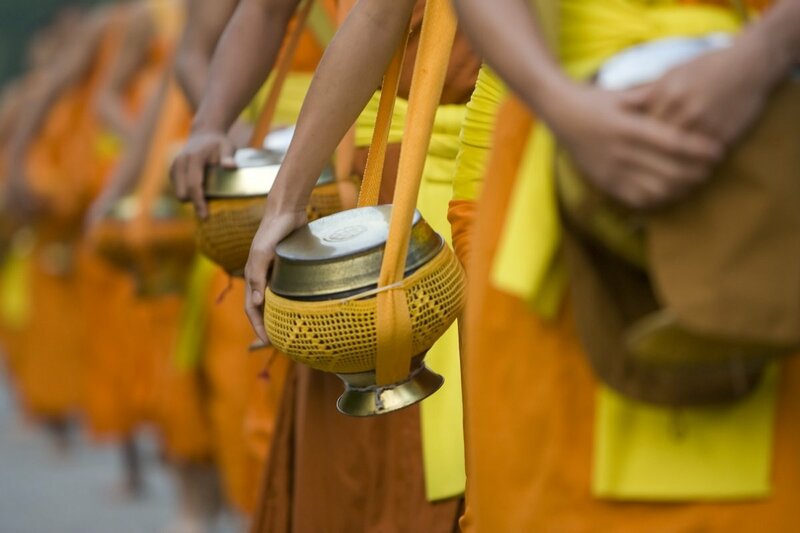 A member of every family comes out into the street with gifts of food or drink, which they place in the monks’ begging bowls. As an observer, you cannot fail to be fascinated by the respectful silence and the great dignity that accompany this daily ritual. Later on, the guide will take you to the morning market, where you can find everything from fresh meat to tasty spices. It is here the locals shop for their daily meals. After these early morning experiences, it is time to return to the hotel for breakfast. The rest of the day’s activities take place south of the city. The first stop is Ock Pop Tok, a working arts and crafts centre. It is an extremely interesting facility, where traditional production methods – such as the batik dyeing technique from the Hmong people, or the weaving styles developed by the Lao-tai people – are applied to new designs. 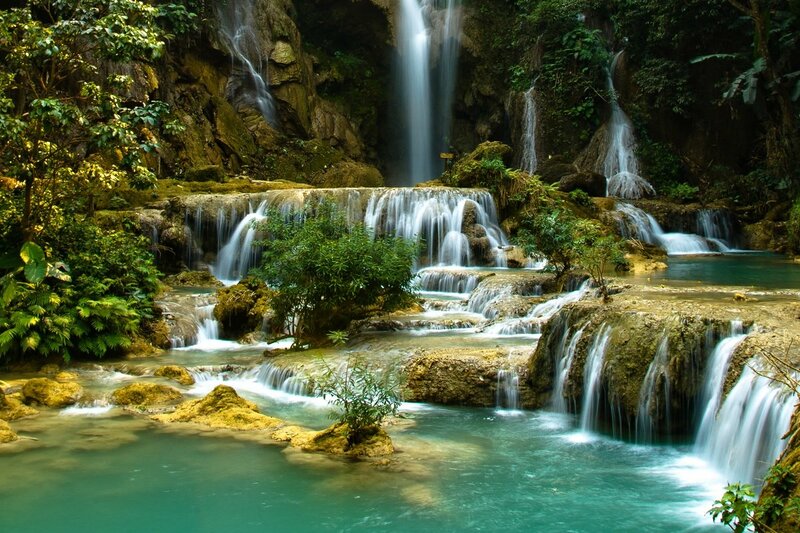 The next port of call is the Kuang Si waterfall, with its crystal clear water. A number of natural pools have been formed at the base of the falls, and you are welcome to take a refreshing dip in them if you choose. Near the waterfalls, there is a centre devoted to the beautiful Malay bear, a species that is seriously threatened with extinction. The reasons for this are that its natural habitat is disappearing, and that it is hunted by poachers for its gall bladder, which is used in Chinese medicine, for example. Board the traditional long boat at Wat Xieng Thong quay and enjoy the soothing sailing tour upstream. En route you will pass the sacred Pak Ou grottoes, where you can see thousands of Buddha figures. The tour then continues along the river to Kamu Lodge, which you should reach around lunchtime. On arrival, you will be checked into your supersize tent with its own modern bathroom, after which a delicious lunch will be served in the airy lodge restaurant, located right next to the paddy fields. – Panning for gold in the Mekong River (from January until June) – you may keep whatever you find! For dinner, you will be served a sumptuous feast of dishes prepared in line with the traditions of the Kamu tribe. The lifestyle and traditions of the Kamu are closely linked to nature – a way of living that city-dwellers tend to have forgotten today. The morning is given over to a trek through the jungle, where your guide will talk about the local flora and fauna. In the afternoon, there will be lessons in traditional fishing techniques – and you can have your catch served for dinner. You can, of course, also choose to relax and chill out at the lodge, enjoying the serene tranquillity that permeates the area. Make the very most of your last morning at Kamu Lodge before taking the boat back to Luang Prabang. On arrival in the city, the rest of the day is yours to do with as you wish. 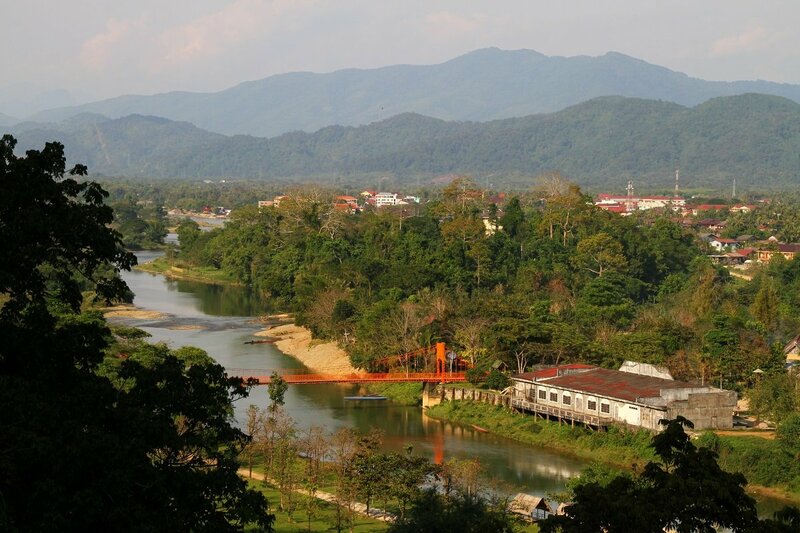 Today, you will be driven to Xieng Khouang, a journey of 7 hours. You will stop several times en route, giving you plenty of opportunities to admire the undisturbed life in the country. In many places, it will actually feel like you are visiting the Far East as it was 30 or 40 years ago. 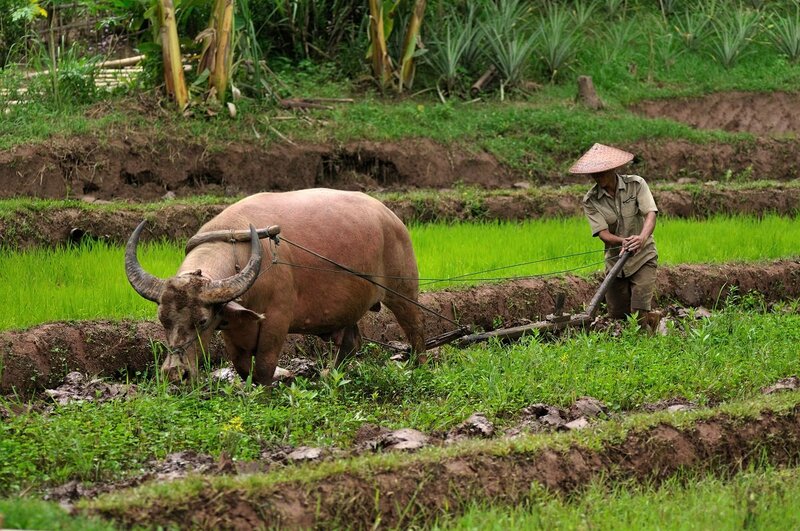 Xieng Khouang Province was a part of the Ho Chi Minh trail during the Vietnam War. This trail was one of the most important supply lines to the Viet Cong in South Vietnam, so the area was heavily bombed by the American Air Force. On average, a bomb fell here every eight minutes throughout the 11-year conflict. This made Laos the most heavily bombed country ever, a fact that is naturally reflected in the country’s history, the memorials and the self-awareness of the population. On the agenda today is one of the absolute highlights of your tour. 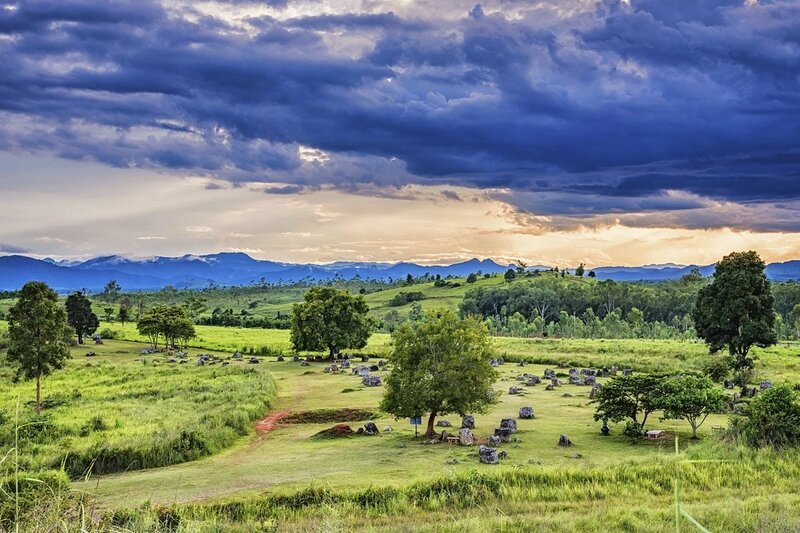 The ‘Plain of Jars’ is an impressive archaeological area where hundreds of carved stone jars lie scattered across the plateau. Most of the stone jars are the size of a grown man, and the biggest weigh up to 14 tons. Very little is known about why the giant jars were originally created, nor about the civilisation that created them. The jars are several thousand years old, and their original use remains a mystery. Geological investigations have revealed that the jars do not stem from the area where they stand, and it is not known where the stones came from. After the visit to the Plain of Jars, the tour proceeds to the former capital city of Muang Khoun, which now lies in ruins. 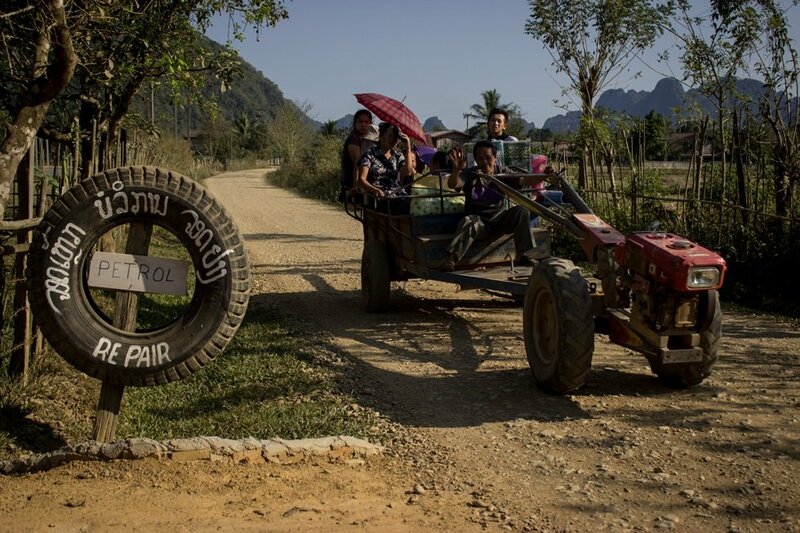 The day is given over to another long journey – all the way to Vang Vieng. The tour takes around 6 hours, with several stops en route. 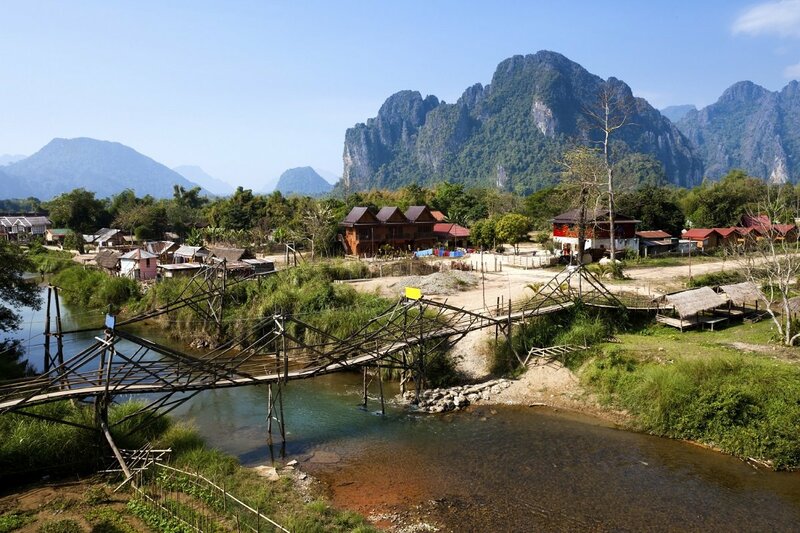 For many travellers, Vang Vieng is a small slice of paradise. 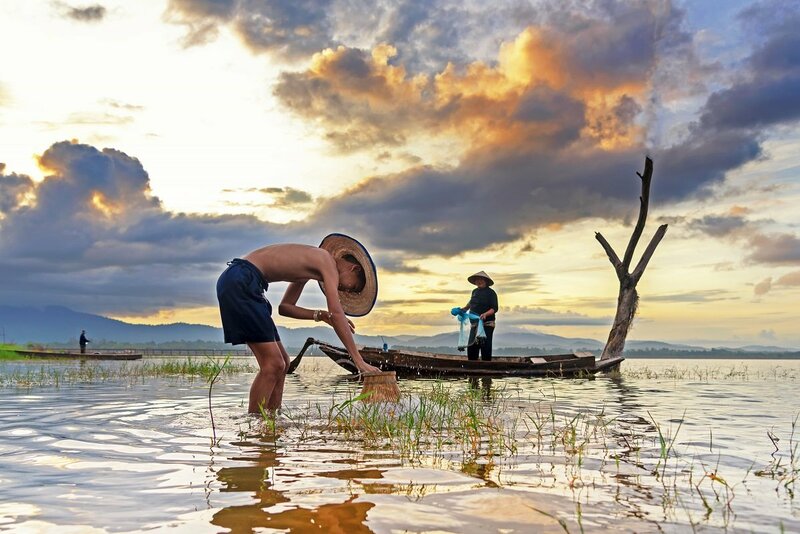 Surrounded by tall limestone cliffs covered in green vegetation and rising almost vertically from the flat paddy fields, and traversed by the gently flowing river, the little town has certainly been blessed by Mother Nature. The river is the setting for a great many activities, including ‘tubing’ (the term for floating down a river in giant inner tubes). The day is yours to do with as you wish. There are plenty of options, and the choice is yours: rafting, kayaking, visiting the local grottoes, cycling, strolling through the town, or simply chillaxing at the hotel. 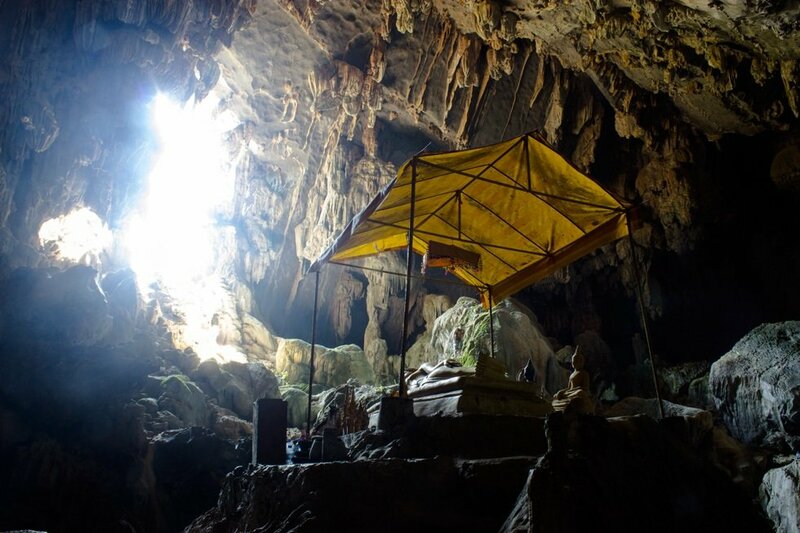 Tham Norn is one of the biggest grottoes in Vang Vieng, while Tham Poukham Cave is the source of a spring that attracts a great many visitors keen to swim in its crystal clear water. 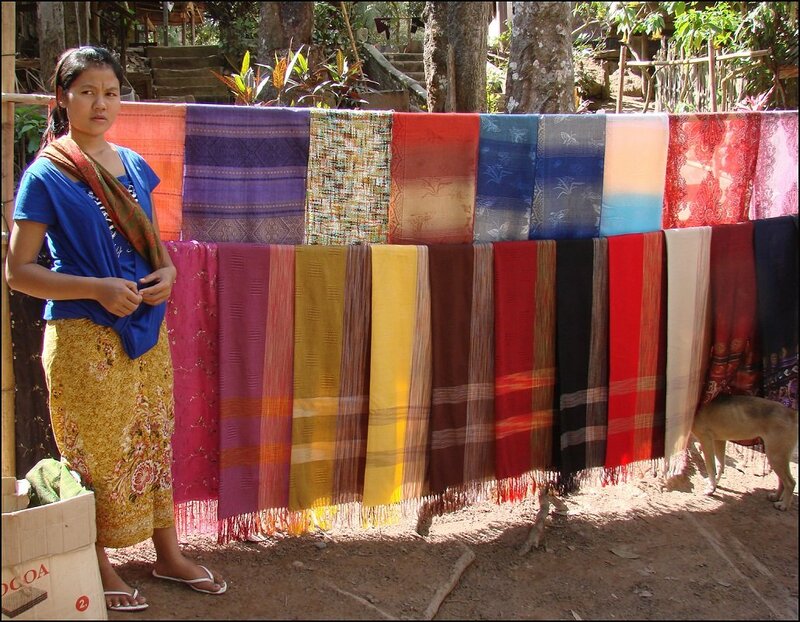 The local market in the northern section of the town primarily sells foods, but you may be lucky enough to find beautiful, hand-woven Laotian textiles such as ‘phaa sin’ (sarongs), traditional costumes and skirts. 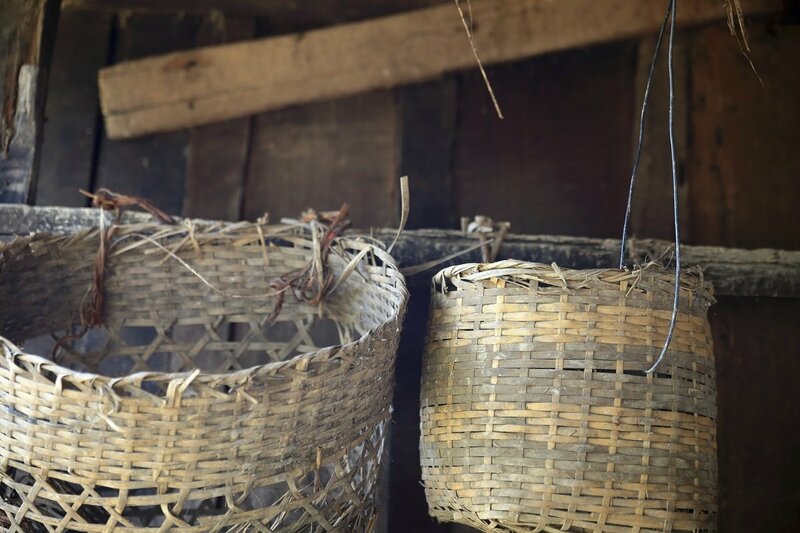 You may even find trays and baskets made of local materials including bamboo, grass and rushes. On the agenda for today: a tour to the capital city, Vientiane. The journey takes around 3 hours. Vientiane is the calmest capital in South-East Asia, and many visitors lose their hearts to the serene tranquillity and the quiet dignity that permeate many areas of the city. 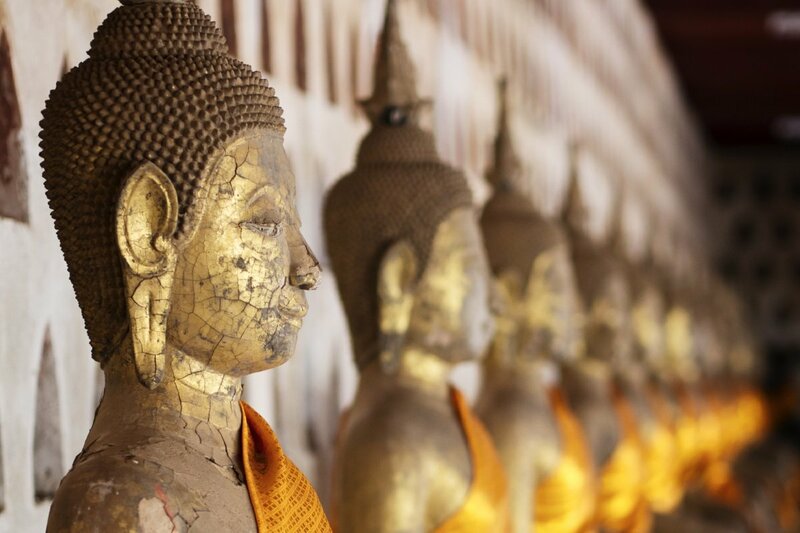 Highlights of the afternoon sightseeing tour include a visit to the Wat Sisaket Temple and to Hor Pha Keo, which houses one of the finest collections of Laotian art. From Patouxai, the victory monument, there is a magnificent view out over the city. 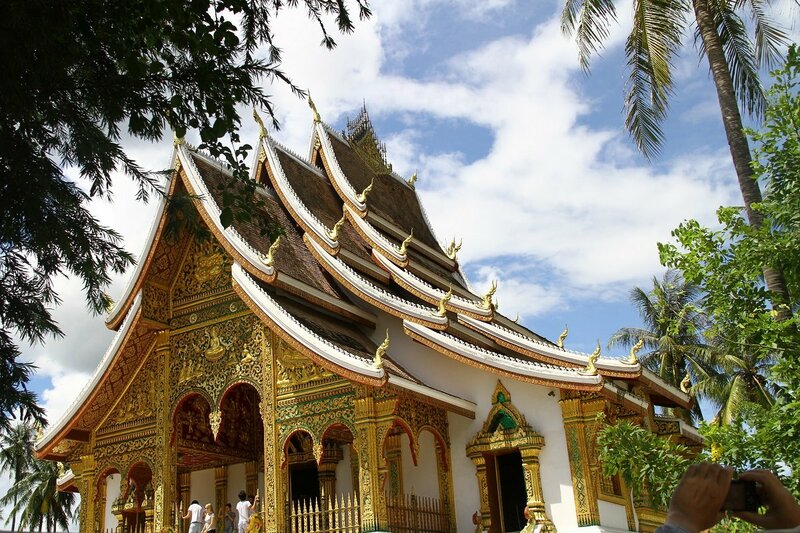 Your tour finishes up at the Pha That Luang ‘stupa’ (Buddhist monument), which is the holiest place in Laos and the country’s national symbol. The stupa was built in the 1500s on the ruins of a Khmer temple. Completely covered in gold leaf, it is a truly impressive sight. The rest of the day is yours to do with as you wish. 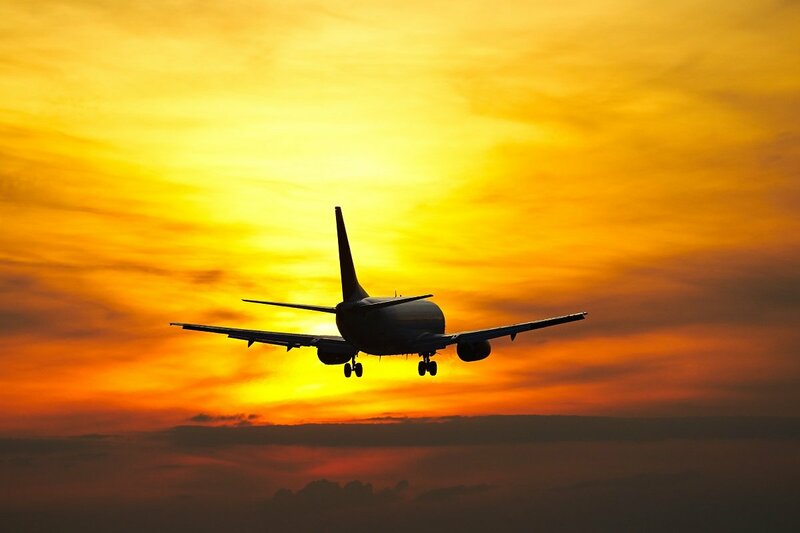 You will be picked up at the hotel and driven to the airport to catch your flight back to the UK, which will include connecting flights along the way.